Missing teeth can really be a disadvantage, in multiple ways. If you are living with one or more missing teeth, you probably know what we are talking about. You may be very aware of the gaps in your teeth when you smile. But it often goes beyond looks alone – you may experience difficulty pronouncing certain words or chewing. The missing teeth may even change your bite in a way that becomes uncomfortable. It's no fluke that dental implants are one of the most popular ways to replace teeth. These durable titanium posts replace the root of the tooth and support a variety of restorations. With dental implants, you are receiving a replacement that comes the closest to the anatomy of a real tooth. Dental implants are one of the most popular options in America for restoring missing teeth. 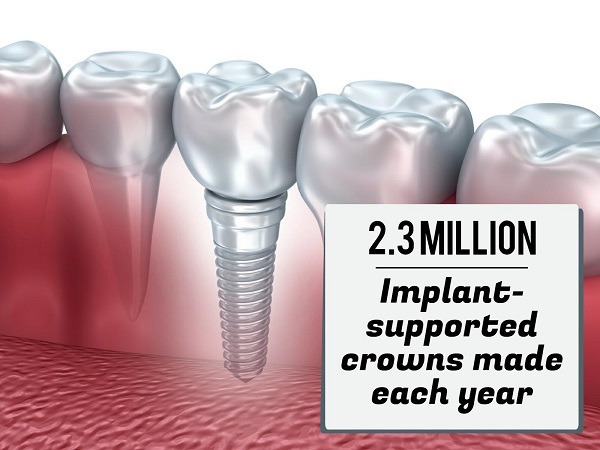 According to the American College of Prosthodontists, about 2.3 million implant-supported tooth crowns are made each year. If the bone beneath the implant site has become deteriorated, we may recommend a bone grafting procedure that transfers bone from one part of your body to your jawbone. While it may sound invasive, rest assured that this is very common for implant dentistry patients. If needed, a bone graft makes the dental implant vastly more successful. With these things in mind, many people experiencing tooth loss would like to have replacements. With implant dentistry, the replacements last decades, and potentially a lifetime. Among dental implants' many benefits is the advantage of jawbone health. The roots of your teeth not only hold your teeth in place but also sustain healthy, functional bone beneath your teeth. When you lose one of the roots, the bone in that area may begin to deteriorate over the years, if the root is not restored. The bone supporting your teeth is known as the alveolar bone. When you chew and bite down, your tooth roots naturally stimulate this bone, which prevents it from breaking down. Conventional dentures and dental bridges – while great options for some patients – do have the disadvantage of not offering this alveolar bone stimulation. It is this shrinking downward of the ridge of bone beneath the teeth that has become associated with aging. A youthful face has firm, shapely and full contours. As people age and lose teeth, their lips begin to look deflated and the lower third of the face appears sunken – or so the old stereotypes would have you believe. With dental implants, this shrunken facial appearance is no longer inevitable. Dental implants restore this power of the tooth roots to sustain the bone. If you are missing one or more teeth, schedule an appointment with our dentists as soon as possible to determine if these titanium roots might be right for you. The rate of bone loss is different for everyone. The sooner you learn about your options for restoring your teeth, the better. We will make sure you understand all of your options, including whether dentures or a dental bridge will work for you. "What is the Procedure Actually like?" Like any surgical procedure, the placement of dental implants may seem like a big deal. And the dentists at Aspenwood Dental Associates want you to feel 100 percent comfortable. We know implant dentistry makes some people nervous, so we want to make sure you get all the clear, straightforward information pertaining to this procedure. Rely on us to demystify the process! The tooth crown or attachable denture is affixed to the abutment and your new smile is ready to go! Some people are good candidates for mini dental implants, which involves a shorter placement process. In fact, the entire procedure can be performed in a single office visit. These implants work with an attachable denture. They are smaller and thinner than conventional implants, so bone grafting is often not necessary. Schedule a consult with us today! Our experienced and caring Aurora, CO, dentists provide care based on patient choice: We empower you to choose from your treatment options, but we will make sure you clearly understand each of these options. To arrange your appointment, please call Aspenwood Dental Associates at 720-400-8546.